Despite the (deserved) attention being focused on the sending taking place at Hueco, people are actually bouldering in other parts of the country. Take Dave Graham for instance who rang in the New Year at Arkansas’s Horseshoe Canyon Ranch. He has had a rather productive last week to end 2007 and start 2008 on a high note. He has done 3 solid repeats in Anti-Hero (V13), Sharma’s King Lion (DG’s beta warrants V12) and a flash of Bloody Knuckles (V11). Along with that he has established new problems All Screwed Up (V13), Southern Lean (V12), The Dirty 30 (V12) and The Dirty 40 (V12). Not a bad week. It looks like Chad Greedy has been climbing with Dave so I would expect that we will see some video footage popping up somewhere in the coming months. I have always meant to check out HCR but haven’t been able to for various reasons. 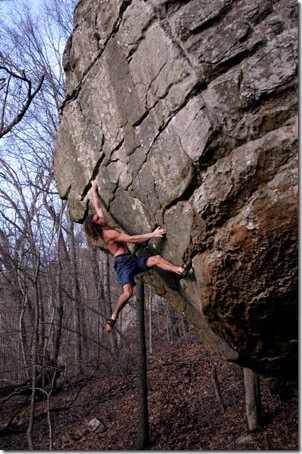 If you are interested in going, you can download a free topo on the bouldering at HRC here. You can see footage of the highball iron cross problem King Lion in both Dosage 3 (Sharma) or at the Momentum Video Magazine free area (Pringle). hey narc, the footage of sharma on king lion is on dosage 3, not 4.
i am curious to see graham’s beta. Corrected thanks. Yeah it would be interesting to see how else you could do that problem. Are you saying dave created the new problem All Screwed Up?? All 4 of the problems All Screwed Up (V13), Southern Lean (V12), The Dirty 30 (V12) and The Dirty 40 (V12) were first ascents. If Tony’s getting to HP40 really late, should he call ahead? They got a flat tire near Kentucky so they’re really behind schedule. It shouldn’t be a big deal, they operate on very strange schedules there. Although I hope he brought a long a permission slip as my experience has been that they like you to fill one out every time you go. You can call me if you want too. Thanks. My mom saved the waiver from the team trip, so he took a copy of that. She’s just paranoid that when he gets there at 2AM, he won’t be able to get in. It’ll be fine, they have ways to check in if nobody is there. Guess who wimped out and came home early this morning because his “skin hurt” and he was “tired”. Brian. check the standings in youth-a for our region there isn’t that many people. He may be able to atone somewhat because he met some guys from Horseshoe Canyon Ranch. In response to claims of my “whimping out”, What had happened was, it was a calculated decision based upon the amount of climbing time we would have monday morning. To us it wasn’t worth the extra few hours on monday to flail on projects before we had to leave. In regards to photographic evidence, I think once the narc posts some more pictures or converts said images to some CD like medium, photographs may begin to appear. Unfortunately, I wasn’t able to make their accquaintance, however it is possible that we met and I didn’t recognise them. We did however get the hookups for the Horseshoe Canyon Ranch. Fair enough. I will try to dig up more photos although I don’t feel like there are many left from the HP40 set. Leave a Reply to Climbing Narcissist Click here to cancel reply.